Adam Lambert Going Back to Reality TV – As a Judge! You are here: Home / Adam in the Media / Adam Lambert Going Back to Reality TV – As a Judge! Adam Lambert has announced via Billboard.com that he’s going to become a judge on Australia’s X Factor. This is not a one-time appearance, he’s in for the whole season. Thank you @creativesharka for the picture! Adam never ceases to amaze us with his versatility. As we know from his coaching and judging appearances on American Idol for the past 6 years, it’s a perfect fit for his talent. I’m curious how this might affect a new album though. Not only the sounds he’ll create while he’s down-under, but the eventual release date of it. From this additional article on the same subject, the last line is “Adam will also be recording the follow up to The Original High with executive producers Max Martin and Shellback.” I haven’t found anything else to back this up with. The X Factor commitment just might provide Adam with a great opportunity for him to rest and come down from the amazing Queen tour however, they have more dates in Israel on September 12 and Asia from September 22-30. But living in Australia with the great native rhythms and beats may lead to a fantastic entry in Adam’s chameleon-like music catalog. Adam Lambert is going down under. 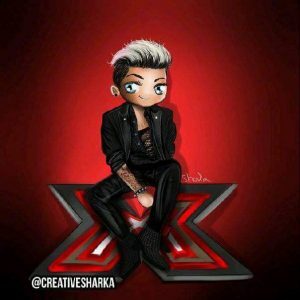 The American Idol season eight runner-up — on tour this summer with Queen — is set to be the third judge for season eight of The X Factor in Australia, he announced Tuesday (June 21) on Twitter. “Big News!!! I am going to be a judge on @thexfactor_au !! !” he wrote. Lambert will join Sydney native Iggy Azalea and singer Guy Sebastian. The show is expected to replace host Luke Jacobz, reports The Daily Telegraph. He’s going to do such a great job …. more happy hours spent chasing YouTube lol. Awesome ! I can hardly wait for his next album too. I hope the videos are all over YouTube!